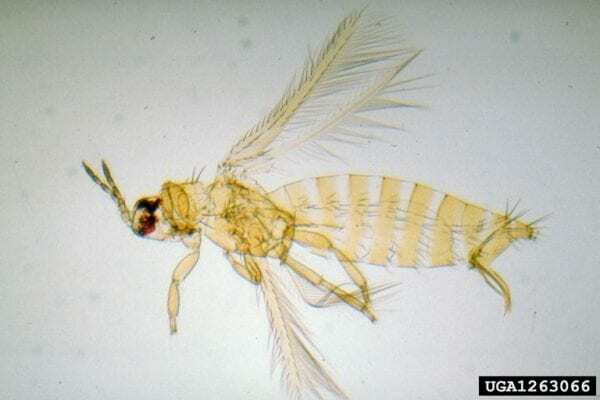 Thrips are unique insects assigned their own order (Thysanoptera). This order is named for the fringed wings found on adult stages. 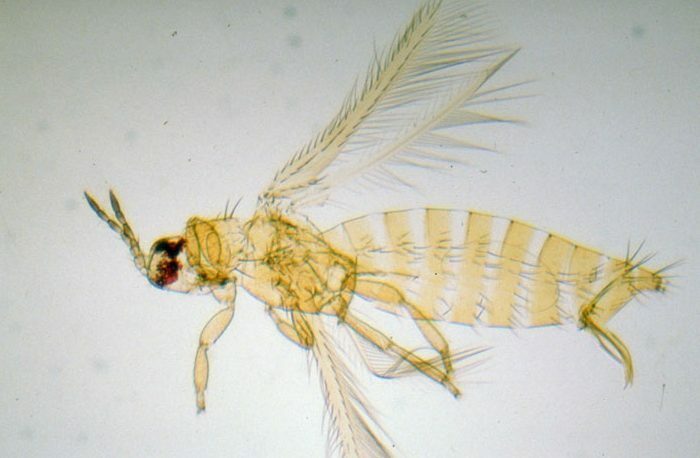 Figure 1 shows these wings as small, narrow, and surrounded by tiny hairs. 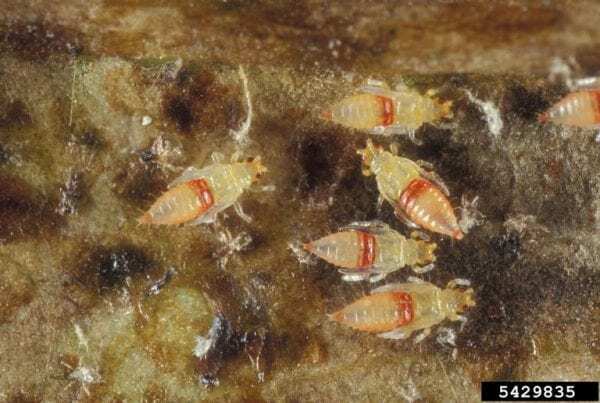 Thrips are one of the smallest orders of insects. Most are slightly more than 1/32 inch (1 mm) in length, which is about the width of the tip of a sharpened pencil. They can be seen with the naked eye, but magnification is required for identification to insect order. Thrips are a major pest species of ornamental plants and cause damage through their rasping/sucking mouthparts used to consume plant sap. Thrips can be difficult to manage because they develop quickly. Many species can complete a generation in just 2 weeks. Species of thrips can feed on fungi, plants, and other insects depending on their classification. Determining the classification is not difficult if you have a hand lens. The order can be separated into two groups: tube-tailed thrips and saw-tailed thrips. Tube-tailed thrips (figure 2) have a tube at the posterior end of the insect that is easy to see with a 10-20 x hand lens. These thrips are larger (2.5 to 3 mm) and are all in the same family (Phlaeothripidae). 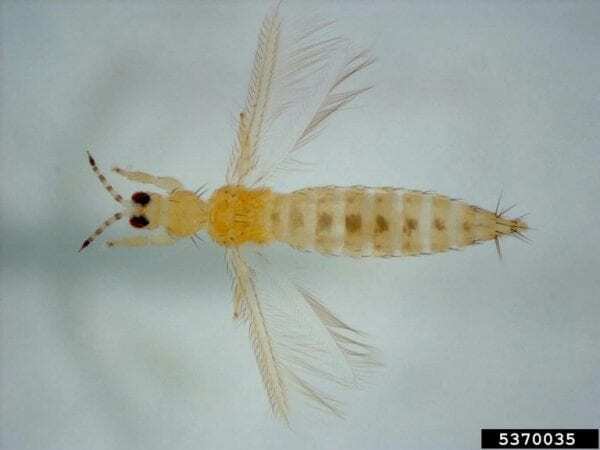 Tube-tailed thrips mostly feed on fungi or other insects, with only a few species that are pests. The more common plant pest thrips, however, are all saw-tailed thrips. The ovipositor on these thrips is like a serrated knife (figure 3). With only a few species being plant pests, the two most common tube-tailed thrips are weeping fig thrips and Cuban Laurel thrips (Gynaikothrips spp.) (figure 2). Both attack ornamental figs, with no records of attacks on fruiting figs. The females feed on the leaf to produce a folded or rolled leaf gall (figure 4). Weeping fig thrips make leaf folds on weeping fig (Ficus benjamina), and Cuban laurel thrips attack banyan trees. Once the gall is formed, she uses the protected space to lay eggs on the surface (figure 5). Leaves that are galled never open or unroll again. These thrips have been observed feeding on other plants, but they can only reproduce on their unique Ficus hosts. Because weeping fig and banyan are evergreen, the damaged leaves can persist even after thrips may have left the plant. You can easily open these leaf folds and rolls and see if thrips are inside. Most saw-tailed thrips would feed and reproduce well in a greenhouse or a crop field. In fact, several pest thrips feed and develop on weeds at the edge of a nursery or crop field. Common examples of saw-tailed thrips include Chilli thrips, flower thrips, and greenhouse thrips. 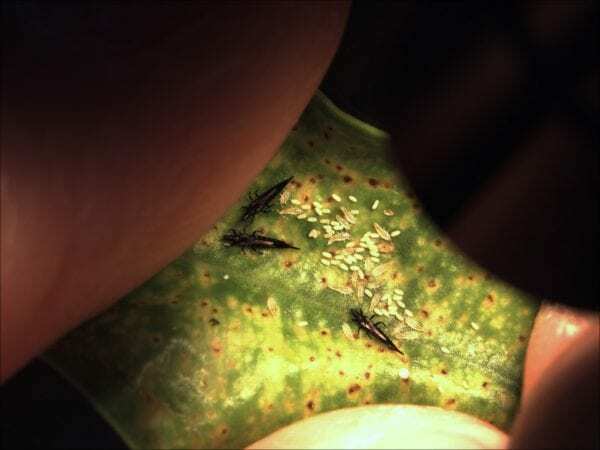 Adult saw-tailed thrips are primarily female, because female thrips develop from unfertilized eggs, while male thrips develop from fertilized eggs. Females use the serrated edge of the ovipositor to cut small holes in plants and deposit eggs. The softer plant tissues of new leaves or flower petals can have scars from oviposition. The feeding damage of redbanded thrips on azalea can be confused with feeding damage by azalea lace bugs or mites. In this case, you must sample the plants to determine which pest is present. See the Monitoring Thrips section for more details on sampling plants for thrips. When eggs hatch, the immature thrips wriggle out of the hole and begin to feed. The first two life stages are called larvae stages and resemble adult thrips but much smaller and without wings. The next two stages are named pupal stages because they do not feed. Both pupal stages have obvious developing wings (wing pads) that give them a different appearance than larval stages (figure 6). It is common for the pupal stages to drop from the plant leaves or flowers and complete development in the soil or leaf debris below the plants. Adult thrips will then emerge from the soil and debris and find new hosts for feeding and egg laying. Figure 4. Leaf galls caused by tube-tailed thrips on ornamental Ficus. Two species of tube-tailed thrips—weeping fig thrips and Cuban laurel thrips—can cause galls on Ficus. Each thrips is specific to each host plant. Several thrips are important vectors of plant viruses called tospoviruses. Tospoviruses are not curable in plants and have more severe consequences on growth and marketability of herbaceous annuals and perennials. The two most common thrips-vectored viruses in ornamental plants are impatiens necrotic spot virus and tomato spotted wilt virus. The virus names can be misleading because there are hundreds of possible hosts of each of these viruses. Some plants infected with these viruses can remain symptomless (asymptomatic) or may only develop symptoms under periods of plant stress. Among saw-tailed thrips, western flower thrips is the most efficient vector of tospoviruses. Tospoviruses are acquired and transmitted during feeding. There are only three feeding stages: adult and two larval (first and second instar) stages. The life cycle of the virus is tied to specific thrips life stages. If first instar larvae are feeding on a plant (with or without symptoms), they can internalize the virus. Larvae don’t have wings, so they can move far between plants. Figure 5 Typical egg cluster of tube-tailed thrips on ornamental Ficus. They are capable, however, of transmitting the virus to another plant. If infected larvae are moved on cuttings or between plants that are touching, they can transmit the virus. They retain the virus inside as they go through the pupal stages and become adults. As adults, thrips can transmit the virus to other plants and across greater distances. But an adult is only capable of transmitting virus if that individual thrips fed on an infected plant as a first instar larvae. The adult is incapable of acquiring the virus from an infected plant. Once infected, the adult can transmit the virus as long as it lives. 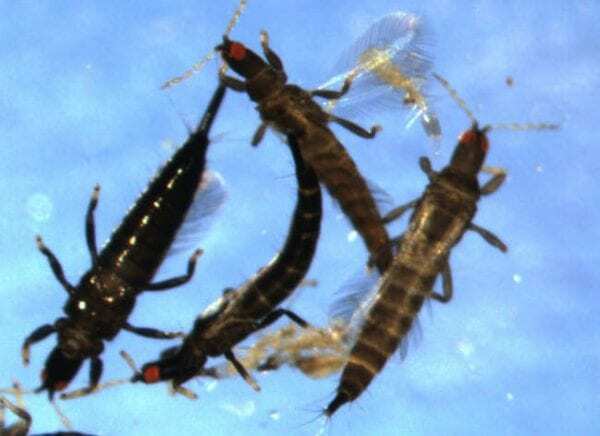 Adult western flower thrips have a maximum lifespan of 75 days, with a typical life span of about 13 days in summer. Thrips that move onto a nursery or into a greenhouse from outside could be infected and live long enough to feed and transmit the virus. These viruses can also affect thrips behavior. Virus-infected plants are more attractive to thrips, and infected thrips tend to feed more than thrips not infected with the virus. Unfortunately, impatiens necrotic spot and tomato spotted wilt virus produce a range of symptoms that can be mistaken for other disease or plant health problems. If you see stunted or wilting plants or discoloration or dead (necrotic) spots on leaves, remove that plant(s) and have it tested at the Auburn University Plant Diagnostic Lab. Ignoring a possible virus infestation, especially when thrips are present, can only make the situation worse. Fortunately, there are many ways to sample thrips. Sticky cards are the most common. Sticky cards will trap thrips as they fly toward a yellow or blue card. If using sticky cards, you will need a minimum of 1 per 1,000 feet2 of production area. In greenhouses, sticky cards are also useful near entrances (doors and vents) to determine if thrips are coming in from outside. Thrips are easily blown by wind, so numbers on sticky cards may not adequately reflect the population of thrips on plants. For example, Chilli thrips are more abundant on sticky cards downwind of infested plants than on cards placed upwind. Sticky cards are not the best way to capture thrips to be used for species identification. The sticky surface makes it difficult to remove the insects intact. Sticky cards also do not measure thrips directly on plants nor do they account for the presence of immature stages. They are only a method to sample the adult stage of thrips. 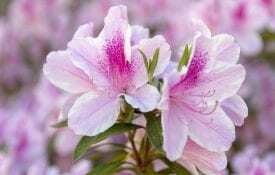 Certain indicator plants are also useful because they have either been attacked before or they show damage symptoms more readily than other plants. Roses and gerbera daisies are common indicator plants for western flower thrips. Chilli thrips have distinct preferences for peppers, Mexican heather, roses, cleyera, bamboo, and Indian hawthorn. Among roses, the cultivars ‘Don Juan’ or ‘Sunflare’ show damage at lower densities than other varieties show. These more susceptible plants would be the best place in a greenhouse or nursery to begin sampling. Thrips can easily be dislodged from plants by shaking (beat sample or tap method). 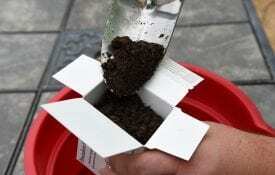 A beat sample is useful for sampling adult and immature life stages and involves shaking or tapping plants above a piece of paper on a clipboard, a white or yellow frisbee, or a commercial beat sheet. This method allows you to count the number of thrips per plant or block. It is the fastest (about 2 minutes per sample) and least expensive way to sample thrips, but it may also require a hand lens to count immatures and smaller thrips (Chilli thrips). Live thrips found in a beat sample can easily be captured in water or alcohol for identification. You can wet the tip of your finger and then touch the thrips; they will stick to your wet finger. Place your finger over the mouth of a vial with alcohol and wash or carefully brush it into the vial. You can collect leaves or flowers into a plastic bag or a small jar with alcohol (alcohol wash method). Alcohol washes can be expensive and timely, and they require sorting or filtering of the thrips in the solution to get a count. Each sample takes about 15 to 20 minutes to field collect, sort, and count. But this is the most accurate method for sampling adult and immature thrips. For Chilli thrips, terminal growth is the best place to take plant samples. Flowers and flower buds are the best place to get plant samples for western flower thrips. You will need magnification (hand lens) to count thrips. Insects in alcohol or on plants can also be submitted to the Auburn University Plant Diagnostic Lab for identification. For species identification, diagnosticians must slide mount thrips and look at different features of wings, antennae, and body hairs under high magnification. Regardless of your monitoring technique, keep weekly records of the number of thrips captured by greenhouse, bed, or bench. Plot these numbers on graph paper or by use spreadsheet software. The example graph in figure 7 shows data from thrips populations in three areas (greenhouses or beds) over four samples. Once plotted, changes in abundance of thrips in these areas can become useful for making decisions and evaluating insecticide applications. In this example (figure 7), damage was noted and an insecticide applied on June 7 in area 3. Similarly, thrips populations increased between June 7 and 14, which prompted an insecticide application in area 1. Regular samples from crops prone to thrips damage (roses), provide information for making decisions before thrips damage occurs. 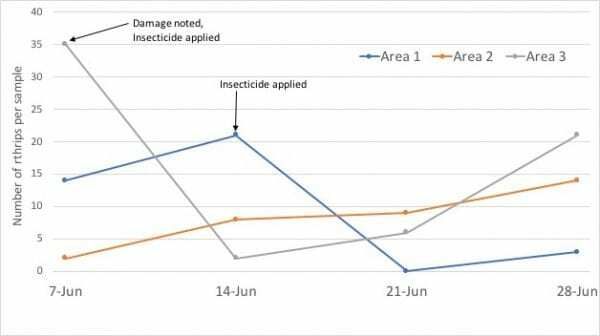 Likewise, these data also show that insecticides used in this example resulted in a knockdown of the thrips populations that was still evident 14 days after the application. Because of their size and cryptic habits, thrips are one of the most difficult insects to control. Thrips management requires thought about integration of control as well as rotation of chemical controls. Biological controls are the most successful nonchemical controls for thrips. Predatory mites, minute pirate bugs, and lacewings as well as parasitoids and pathogens are commercially available controls for thrips. Predatory mites can be recognized by their peculiar names, Amblyseius or Phytoseiulus. These mites are small, nearly microscopic, and released onto infested plants. Mites may have a preference for a particular life stage, such as immature thrips. They can, however, consume 2 to 3 thrips per day per mite. In one study, one release of predatory mites provided 28 days of Chilli thrips suppression. Natural enemies can provide suppression\control of thrips for longer periods of time than insecticides. They often cost more per release than an insecticide, but they can establish in woody crops, greenhouses, or overwintering houses to provide a buffer against outbreaks of thrips. Biological insecticides containing Chromobacterium, nematodes, Beauveria, or Metarrhizium also have some effectiveness against thrips. Similarly, horticultural oil, neem products, and kaolin clay have been shown to reduce populations of some thrips. These biological or nonchemical control products may not be applicable in all situations, but they can be used to rotate into an integrated management program for thrips. A complete list of pesticides available for thrips control is available in the Southeastern US Pest Control Guide for Nursery Crops and Landscape Plantings. It is important to read the use site and frequency of application information on the label. Some products may be labeled for use in landscapes but not nurseries or vice versa. Because thrips have a short generation time and can produce 50 to more than 200 eggs per female, the possibility of insecticide resistance is a real concern. Resistance occurs when individuals survive a treatment and then reproduce passing on the resistance genes to the next generation. Insecticide resistance management is why some labels have restrictions on the number of applications over a certain time period. These restrictions are on the label to prevent insecticide resistance from developing. Populations of western flower thrips, for example, are documented resistant to at least 20 active ingredients from seven different chemical classes. The repeated use of back-to-back applications of the same product against thrips has a high likelihood to select for resistance. Insecticide resistance management is a significant contributor to the increasing cost of insecticides in the United States. For these reasons, it is important to understand how to manage resistance and practice product stewardship. Insecticide labels provide details on product use, but do not often explain the concept of rotation. 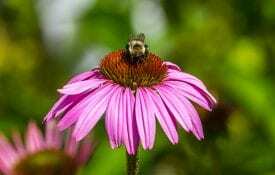 Mode of action is how insecticides kill an insect. Most of the available insecticides act in one or more places in the insect nervous system. It is important to rotate modes of action and not just chemical classes to manage insecticide resistance. All insecticides are classified according to mode of action and chemical class by the Insecticide Resistance Action Committee (IRAC, www.irac-online.org). All insecticides are assigned a number or number and letter combination by IRAC (table 1). The number represents the insecticide mode of action and the letter represents different chemical classes that may have that mode of action. It is not accurate to say that you should rotate chemical classes to prevent insecticide resistance. Some chemical classes share modes of action with other chemical classes. For example, organophosphate (e.g., Orthene or Dursban) insecticides have the same mode of action as carbamate insecticides (e.g., Sevin). The IRAC coding system makes it easier to understand what is best to use in rotation with other materials. Products with the same IRAC number should not be used in successive applications. Here is an example. If you are using a product that is 3 A, then you do not want to rotate to another product with a 3 in the IRAC code. In that case, you would be selecting for resistance to pyrethroid insecticides. It would be better to change to a product in the IRAC group 5 or 6 for the next application. Like plants and people, thrips can move within the nursery, within a city, or even within a county. As thrips move, they contact many different insecticides. Nurseries or greenhouses adjacent to farmland may be exchanging thrips populations during a season. The product stewardship that you practice on your nursery can influence thrips in those field crops and vice versa. For these reasons, exposure of thrips to insecticides does not have to be on plants with damage or active infestations. Most thrips can use a wide range of hosts and can be found feeding or temporarily using many different plants in the greenhouse or nursery. 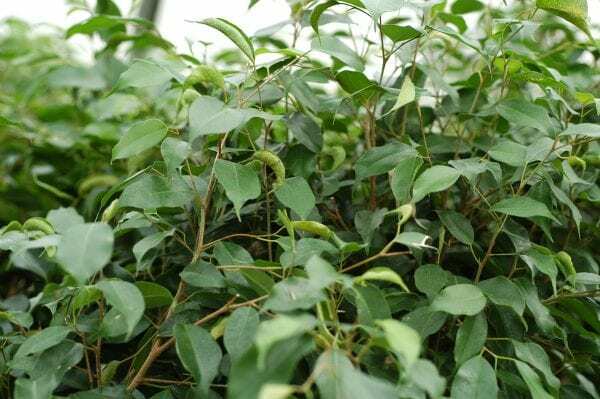 Especially with the recent invasion of Chilli thrips, insecticide use on ornamentals should be approached at the nursery level as well as at the crop level. If you have experienced a problem with Chilli thrips, it is no longer a good practice to spray the entire nursery or greenhouse with the same product over and over. Using only one approach to thrips management could lead to longer term problems with resistance. Spot spraying and monitoring are tools to long-term thrips management.